Dans l’atelier de réflexion de ce vendredi 23 octobre 2015 qui a eu dans les enceintes du Centres Jeune Kamenge. Teddy Claude Harushimana a présenté son étude sur la généalogie de l’établissement des ethnies au Burundi afin que la génération présente sache l’histoire des différentes guerres qui ont eu lieu et leur cause afin qu’elle ne commette pas ces mêmes erreurs. Dieudonné Nahimana a dirige un moment de débat qui a pour finalité un programme de différentes activités à entreprendre pour influencer la jeunesse dans leur façon de penser vers la voie de la construction du Burundi. Il est temps pour les Burundais d’entrer dans une ère de leadership où le leader est serviteur de ceux qu’il dirige et non le contraire et où le bien être des prochains est prioritaire. Et savoir que le développement économique commence par soi-même dans le fait d’être entrepreneur chacun dans son domaine. It’s been more than a year since team Imboneza went to Brazil to represent Burundi in the Street Child World Cup (SCWC). Innocent still remembers the great moments of the tournament vividly. He was nominated the best football player in the whole competition and team Burundi occupied the second place in the World Cup. Looking back at his childhood and the challenges he went through, Innocent never knew that he could get out of Burundi, let alone play in a World Cup. He started living on the streets when he was four years old because of war and poverty. Back then, Innocent experienced a lot of bullying from older street boys and struggled to find food and shelter on a daily basis. In 2004, with the assistance of New Generation, he got a safe place to live and started going to school. Today, Innocent has completed his studies. He along with the rest of the football team continue to impact the whole country with their testimonies, songs and skills in football. In February this year, the team participated in the New Generation “Burundi, Urwaruka Turashoboye” (Youth We Can) campaign in Muyinga. The campaign began with a good football match which attracted a large crowd. After the match, Innocent had the opportunity to speak, sharing his life testimony and performing some of his best songs. Though currently jobless, Innocent is still working hard to improve his life and the lives of other children who are still in the streets. Last month was exciting for the young entrepreneurs from Makamba and Muyinga. They participated in two special training centered on accounting and financial management of income generating activities as well as tax regulations in Burundi. They were delighted to learn new technics that will enable them to have businesses that are well structured and well planned. They also came to Bujumbura on the last week of August to officially register their organizations with API (Burundi Investment Promotion Authority). On the 28th August 2015, a special graduation ceremony for the MFSII participants, took place at the Royal Palace Hotel. Different partners and government officials attended this event. A special prize of one million was given to three participants who participated in a business plan competition and wrote the best business plan. Last month, as part of the Gir’ubuntu project, we organized a two-day special workshop bringing together more than 80 young people from Bujumbura and upcountry who belong to different political movements, organizations and groups. The theme of this conference focused on truth, forgiveness and reconciliation in order to promote personal and national healing. Nahimana Dieudonne, the CEO of New Generation, explained to the youth that we need to be a generation that contributes to the healing of our country in order to stop the cycle of violence in Burundi. Through a presentation made by the project manager of New Generation, Teddy Claude Harushimana, the participants had an opportunity to revisit the past and look at some of the events that led to ethnic rivalry in Burundi. Afterwards, they had an opportunity to discuss in different groups on the strategies to use in order to elaborate a charter whose central theme will be to promote non-violence in Burundi, how to organize debates and activities that can bring the youth together, and how to communicate hope instead of despair through different social media platforms. On the last day of the conference, a program of some of the activities to be conducted in the upcoming days was approved by all the participants. These include a special training on non-violence involving young people from all parts of the capital, sports and artistic activities bringing together different categories of young people in order to promote active non-violence and the use of social media to spread messages of non-violence. This month, the children supported by New Generation concluded the 2014- 2015 academic year in style. They performed exceptionally well in school. We have 40 children in primary school and 9 in secondary school. In primary school, 14 children figured among the top five students of their classes (five having the highest score in their classes) and 16 of them figured among the top ten students of their classes. Only one child will have to repeat his class. In secondary school, they all succeeded with good marks. Last Friday, we organized a special event to congratulate them for their perseverance and success in school. We also distributed special prizes to those who figured among the top ten students of their classes. We wish thank all our partners for enabling us to provide breakfast, lunch and even host some of these children at the New Generation Center. We look forward with excitement to the new academic year starting in the next few days. 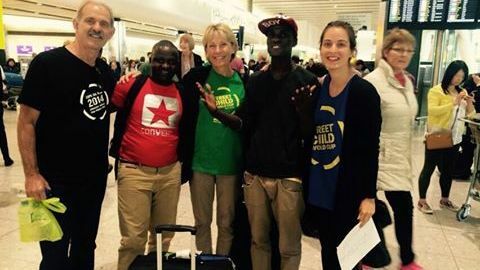 After waiting for their visa for several days in Kampala (Uganda), Innocent and Eric finally flew to England on Saturday the 11th July for a three-month accelerated training in English at Studio Cambridge. They were both excited and grateful to participate in this training. 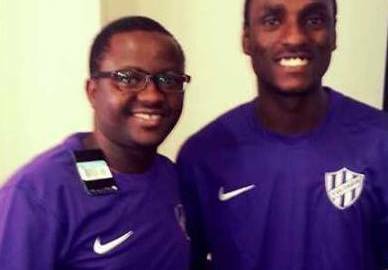 In an interview made before their departure to London, Eric and Innocent expressed their joy for being given such an opportunity to acquire more knowledge which they will come back and share with their friends at New Generation. They were also honored to be the ambassadors of Burundi again, but this time in the UK. They did not forget to thank their supervisors at New Generation who always teach them along with other young people to believe in their dreams in spite of their present situation. We wish to thank Street Child United for all the support provided to these youths and for giving them a chance to pursue their dreams.